Justin Bieber debuted his new ink as he arrived at Pearson International Airport in Toronto on Tuesday morning, July 24. The new tattoo is the Japanese Kanji symbol for music. The new ink sits opposite the ‘Believe’ tattoo on his left arm. So far, the 18-year-old Canadian singer has six tattoos. He’s just 18! Giving the fact that he only began inking himself last year, that means he does an average of six tattoos a year. By the time he’ll turn 30, Bieber will have a collection of 78 tattoos. Our Beckham theory ? Quod erat demonstratum! Over the weekend, Bieber attended the Teen Choice Awards along with his girlfriend Selena Gomez. Bined took home four prizes out of nine nominations. Male Artist, Male Music Star of the Summer, Male Fashion Icon and Single by a Male Artist, for ‘Boyfriend’. 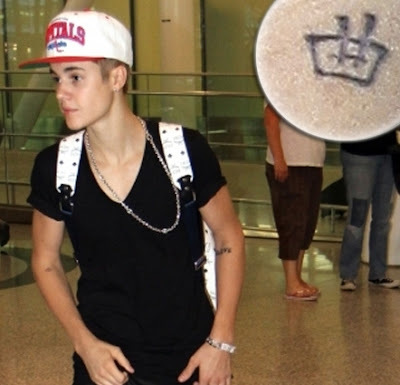 1 comments for "Justin Bieber Unveils New Japanese Tattoo"
I think you have an amazing blog. :)I am actually in need for this information. .. thanks a lot for the share..